Your underwater adventures in the Galapagos with Motor City Scuba will encompass everything from sharks to nudibranchs, and more. The islands are best known for amazing shark diving around Wolf and Darwin Islands. These small and remote islands are best reached by liveaboard vessels for divers. Your diving experience here will generally include Galapagos sharks, silky sharks and lots of schooling hammerheads being cleaned by king angelfish. Seeing marine turtles, schools of tuna, eagle rays, and sea lions is very common and seeing a whale shark is very possible from June through November. All the islands you travel to are amazing sites for underwater photography. Macro photographers will have their fill of sea horses, barnacle blennies, coral hawk fish, and many others. An abundance of rays are at many of the dive sites (including spotted rays, marble rays, golden rays and stingrays) along with sea lions, sea turtles, schools of grunts and snappers. 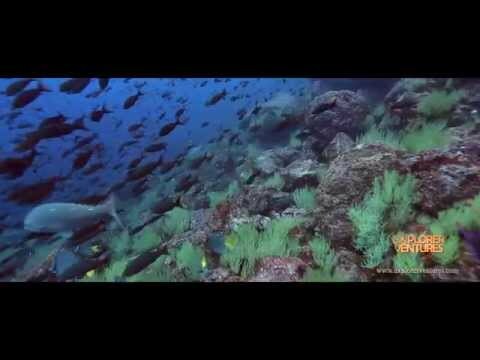 The variety of life in these water is unlike any other place, with thick schools of the native brown striped salema, snappers, groupers, Chevron barracuda and huge sea turtles. There are also many unique things to view on land. Of course, a trip to the Galapagos would not be complete without taking time to watch their most famous inhabitants - the giant tortoises and the Galapagos penguins! Call Motor City Scuba at (248)615-3483 to make your reservation today for a once in a lifetime shark-filled experience in the "Enchanted Islands."